'Gaijin' is a word the Japanese use for "foreigner". The word is composed of two kanji: 'gai' meaning "outside" and 'jin' meaning "person", so a more literal translation would be "outsider". “An outsider” someone who can look in but not understand. “An outsider” some who wants to be a part of something but is being kept away from it. It’s amazing how one word can be such an apt description of how I felt when I first arrived in Japan. I can recall the first thing I saw as I stumbled off the JR Train in Osaka; the bright garish neon lights of a Pachinko parlour. Pachinko may be a national obsession in Japan, but outside of this country now one has ever heard of it. To me as a westerner I'd never felt so confused by what I was seeing. Rows of business man, sat in front of machines, chain smoking and avoiding eye contact with each other. The deafening sound of millions of tiny metal balls bouncing around, balls that seemed so worthless but were being cradled as if they were made of gold. As we venture through the wall of cigarette smoke, into the clattering din my Japanese friend pulls me to one said and whispers "be careful who you talk to here, its owned by the Korean mafia". I thought he was joking to add a sense of excitement, but he was being genuine and they aren’t the only shady organisation in on this money making past time. For years, the Yakuza, Japan’s famed mafia, played a crucial role in running and regulating the industry. It's clear these garish yet inviting halls exist on the fringes of the law in Japan. Even if it’s illegal to bet on the outcome of the machines, Pachinko is actually the almost exclusive cause of gambling addiction in Japan. Of course legally, in the land of the rising sun it’s called “gaming” not “gambling" since the machines pay out 'prize tokens' rather than cash. Even if these tokens can then be exchanged at a nearby shop for real money, the government does not acknowledge this is betting and so Pachinko continues to exist today. The pachinko industry constitutes Japan’s largest leisure activity. The sector employs over 300,000 people and brings in about $225 billion a year. The halls are everywhere and the largest ones actually generate more profit than a Las Vegas casino. 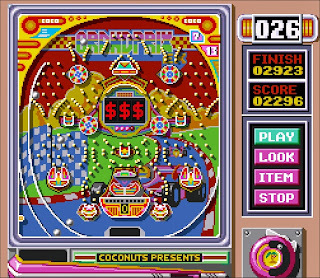 You can see the flash of their neon signs from the train as you pull into stations across the country and each year, over 30 million people play this unholy fusion of pinball table and one arm bandit. Given the popularity it was inevitable that digital versions of the game would appear, literally dozens of them on the Super Famicom. 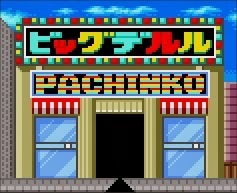 The one that caught my eye encapsulated all the danger and excitement of Pachinko’s shady underbelly. 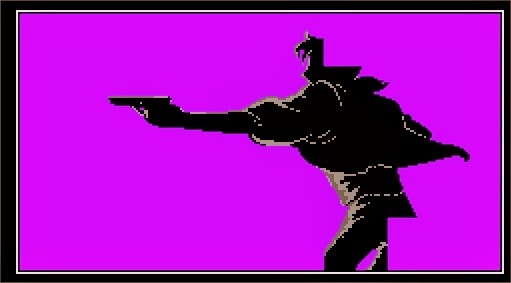 The box encourages this; a man with a gun, with a title for the game suggesting rival pachinko gangs fighting for control. When I see ‘Pachinko Wars’ on a box, I imagine part bouncy ball emulation, part shooting. The title sequence continues this idea. It’s either a rip off of Cowboy Bebop’s introduction or a homage to a seventies style cop show. Either way there's flashy music, trendy split screens and guys with guns. 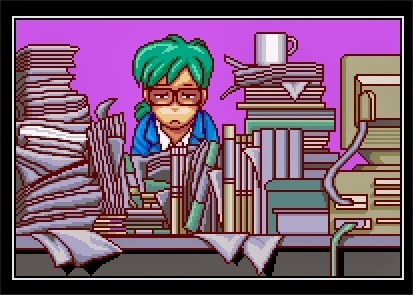 Things do unravel slightly when the game starts, and you're presented an office worker, finishing his shifts. Now obviously without being fluent in Japanese it's difficult to know what's going on. In my head though, Takeshi (I named him after the friend who gave me the tour of the real life Pachinko hall) has a job that is actually a cover for his double dealings with the Yakuza. His shift ends and after flirting with a co-worker and sharing his true angry feelings with his boss (or so I imagine) this wild rouge is free to roam the streets. With luck on his side and a disregard for the law there's only one place he's heading- he's going to bounce some tiny balls around. 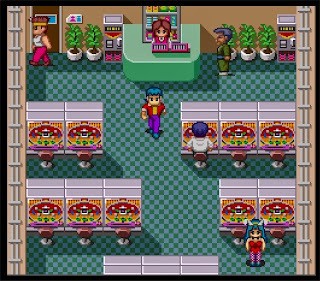 What follows is a Pachinko machine selection screen that is as excellent as it is excessive: An overhead Zelda style view of our protagonist as he moves around the Pachinko hall, chatting to other players and selecting machines to waste his money on. There’s always a danger of feeling 'Gaijin' when playing un-translated Japanese games. You can’t understand the menus, so often there is a great deal of hope selecting from options that it will progress the game. The NPCs are either giving me hints, advancing a rich involving narrative or insulting me – it’s impossible to tell. 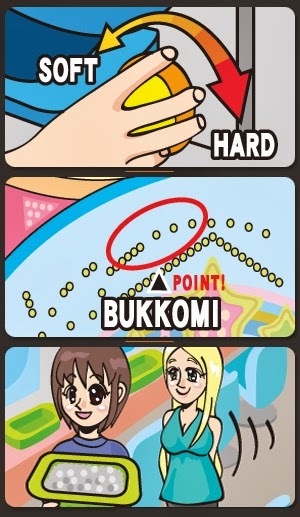 Fortunately I do have knowledge of how Pachinko works to fall back on. Without it this game would be impenetrable. I head to the back of the hall, there’s a girl behind a desk. After exchanging money for ball barings, I guide my little Link-esque avatar around the Pachinko parlour and select a machine. Now the fun really begins, it’s the moment I bought this game for having been too scared to do it in real life. It’s time to Pachinko. As with the real world, you begin play by turning the handle using direction buttons. The further you turn the handle to the right, the stronger the balls will shoot out. Fortunately there seems to be a great deal of sensitivity when it comes to this. Incremental changes can be achieved by lightly tapping the direction buttons and slight changes have noticeable results. Finding a proper balance in shooting strength is the key to playing, as not turning the handle enough will cause the balls to stay put, while turning the handle too strongly will send the balls directly into the exit chute. Your job is to find a sweet spot where the balls bounce between the pins of the table and fall consistently into one of the little bonus holes dotted around the table. For each ball that goes in a hole, you are either rewarded with more balls or a new part of the board will open where other more ball rewarding targets can be found. On one table a successful ‘ball in a hole’ shot gets you a spin on a virtual slot machine shown in the centre of the table. As always, three of a kind wins, but getting two sends the table into what the Japanese call ‘Super exciting Reach mode’. On similar real life tables this often causes the video screen above the table to show an epic battle played out between the number you need to complete a winning set and some other number. The numbers are represented by a famous anime characters, or even films and video game heroes. It is ‘The Reach Mode’ that apparently makes real tables so addictive, as success in this leads to a euphoric period of ‘lucky time’ where you seem to always win. It’s the drive to complete the Reach that makes the average Pachinko addict plunge a month’s wages into a machine in one afternoon. 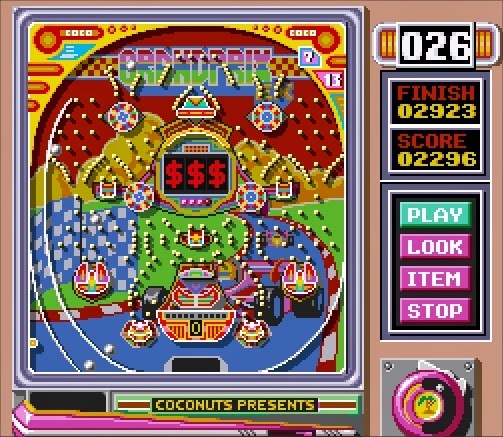 In ‘Pachinko Wars’ Reach mode just means a change of music, yet it’s still enough to cause my emotions start to fly. I hammer the B button as quickly as I can, causing balls to cascade into a door that has just opened on the Pachinko board. I may be on a train, but much like the business men that lose hours in the real Pachinko Parlours I am totally absorbed by the madness of firing tiny virtual balls. 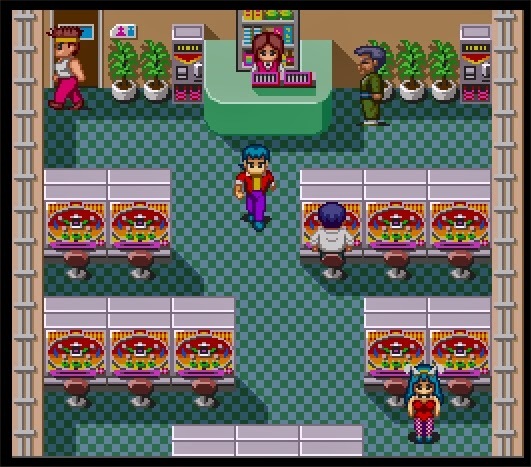 As a recreation of the game itself, the tables in Pachinko Wars are more arcade than many of the multitude of similar games on the Super Famicom. 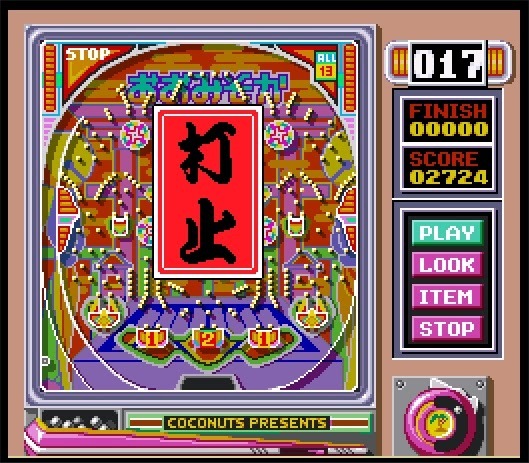 It’s a nice entry point for anyone like me that is new to Pachinko. Simplistic graphics keep the full table on screen at any given point, giving players a good idea of what’s going on. This may help you to better track your ball projection and keep those steel spheres tumbling, but it does reduce the variety of each table. The problem is, when there is a limited choice of tables this static screen is a huge hindrance. Though I can’t remotely claim to be an expert on the subject, games such as ‘Hissatsu Pachinko Collection’ and ‘Pachinko Challenger’ for example seem to be more focused on replicating the experience authentically, albeit a lot more complicated. They both have accurate sounds and ball launching mechanics. 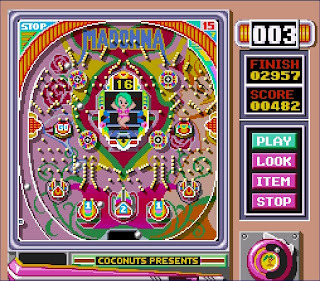 Pachinko Wars however forgoes recreating the ear damaging din associated with Pachinko halls in favour of music: Irritating music which bizarrely sounds Russian and repeats far too frequently. The balls look shiny enough, but they are larger than the gaps between the bukkomi pins. I know ’the house always wins’ but at times certain tables feel like cheap rigged carnival games, when you have the illusion of being able to get to ‘Reach Mode’ easily but in reality stand little chance. 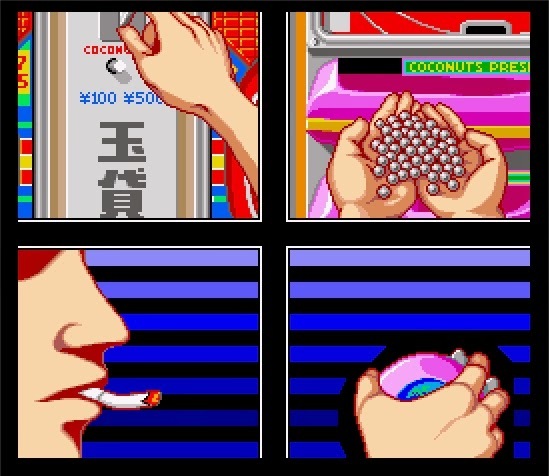 What is odd though is that you can actually finish a table by draining all the pachinko balls from it. To do this you need three things; patience, luck and to beat the ‘finish’ goal with the amount of balls you have. Obviously as you fire balls into the table, you’re adding more to the total number your need to retrieve. 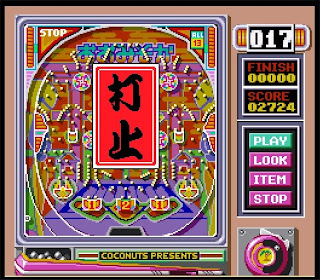 Consequently there is a need to get the sweet spot as soon as possible and maintain a consistent rate of Pachinko ball fire. Draining the table took me two hours of non-stop play. Apart from having ten times as many pachinko balls as I had before I could see no benefit for doing this other than being unable to play the table again. If there’s more going on, tragically it’s getting lost in translation. I imagined finishing a table would cause a cut scene, where the Yakuza leapt on me, Pachinko balls being thrown and guns being pulled. 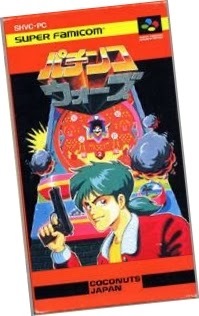 However, the titular ‘Pachinko Wars’ doesn’t seem to extend beyond the box art and introduction sequence. If there is a shooting mini game in here somewhere then I needed to get a lot more balls in a lot more holes to unlock it. Garish blinking lights, overwhelming noise, suffocating smoke, comatose patrons. For a westerner the Pachinko parlour is one of the first signs that Japan is, indeed, the strangest place on earth. Games based on it are never going to be completely accessible despite best efforts. I gave ‘Pachinko Wars’ 4 hours of my life, which was to be frank 238 more minutes than I anticipated when I bought this for a joke on a whim for £1. I didn’t dislike playing it, but I can’t say I understand why people lose their lives to playing Pachinko in real life. Completing ‘The Reach’ may have been fun, but it didn’t drive me to lose days trying to get it again. Maybe, as is the case with all gambling games, when you take away the possibility of winning actual tangible money the thrill goes. Maybe, I’m just to Gaijin to understand the nuances and complexities. I gave it a chance, but in the end it really is just a load of balls. To import games from Japan, eBay isn't your only option though. I always check on sites like Solaris Japan as often they have a game in stock cheaper than the final price it goes for on eBay. The also have a few gadget that removes any worry of getting charged extra at customs, so they're worth a look. I must again stress that I played an Untranslated version of this game, so if I have missed anything through not undersatnding it properly I appologise. I would love to know more from anyone who does understand whats going on. My knowledge of Pachinko is based soley on what I have read in books or online and my person experience in Japan. 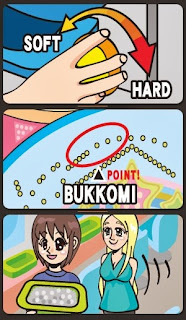 To help explain this, I have included a link to my Travel Vlog which shows some hot Pachinko action. Hopefully this helps anyone who has never had the opportunity to witness the madness themselves! Watch from about 7 minutes 14 in. Thanks Sara. How bonkers that my made up ridiculous story wasn't a million miles off!